For the past several years, Jan Zwicky has been developing a definition and working examples of the word “lyric.” Her writing has taken the shape of poetry and philosophy, neither necessarily confined to the traditions of those genres. Thirty-seven Small Songs & Thirteen Silences is the latest in this ongoing focus, previously explored in collections like Songs for RelFor the past several years, Jan Zwicky has been developing a definition and working examples of the word “lyric.” Her writing has taken the shape of poetry and philosophy, neither necessarily confined to the traditions of those genres. Thirty-seven Small Songs & Thirteen Silences is the latest in this ongoing focus, previously explored in collections like Songs for Relinquishing the Earth (1998) and in her philosophic works, including Lyric Philosophy (1992) and Wisdom & Metaphor (Gaspereau Press, 2003). The songs in this collection are odes, addresses and apostrophes, to household fixtures, human emotions, shades of light, seasons, stretches of land, departures, sounds and solitude. Working with the most associative details, Zwicky has whittled encounters with her subjects down to their integral and resounding notes. A single light shining from a house in the winter is the bathtub’s call to its tired owner. Dew on the grass is the long note of calm in a hurried departure. Every presence contains absence, every pause embodies continuation, every house has “one chink open to the wind.” These are songs to the negative space around solid shapes. Wild grape, nuthatch and August are in part defined by the time around their existence. Bath, laundry and grate have a life both for and beyond their owner, and it is upon these tensions that the poet’s fondness develops. Zwicky’s musical sensibilities give these poems their resolve. The precise lilt of her verse amounts to a resonating frequency for each of her subjects, with the O of each address sounding the driving note. In music Zwicky has captured the energy and suddenness of realizations like homecoming, departure, familiarity and alienation. Her songs walk the tightrope between thinking and being, steadying and strengthening the act of imagination that maintains contact between past, present and future. The seven studies in this collection signal a slower tempo, a downshift into the clipped stillness of memory. Summer months, garden gate, childhood house and silent afternoons are summoned to the surface for a look. These give way to six silences: three-line moments of pause or hush that request careful entrance and exit. Like still lifes or haikus, these silences suspend time within time. Basil springs motionless, grass ripens, pollen settles. As with the absences contained in her songs, Zwicky’s silences embody the tenuous balance between thought and experience. Thirty-seven Small Songs & Thirteen Silences is a vital addition to a remarkable body of work. 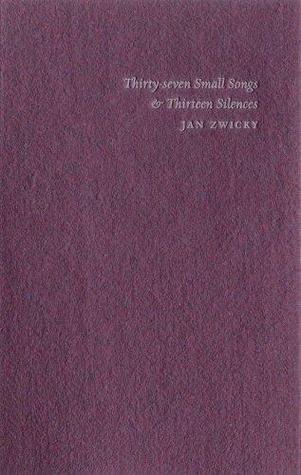 Zwicky’s lyricism proves to the senses what lies within the parameters set by her prose. The trade edition of this book is a 5 x 8-inch, smyth-sewn paperback bound in card stock with a letterpress-printed jacket. The text is printed offset on laid paper.